This is slightly crazy. 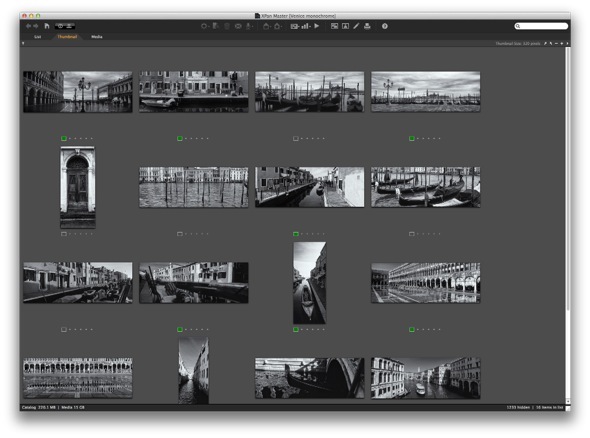 A few weeks ago I decided to work on a small set of photos of Venice, converted to black & white using the excellent Nik Silver EFX 2.0. Silver EFX does a pretty good job of turning digital images into emulations of monochrome film photography. So far so good. But then it occurred to me that I was actually transforming scans of positive film into emulations of monochrome negative film, which is not exactly an optimum process, since there’s a good 5 extra stops of exposure range in b&w, and the contrast curve in positive film doesn’t like being stretched too much. Well anyway. I’d probably have been better off loading Agfa Scala in my XPan in the first place. Or even Ektar 100. And apart from that, the originals actually were shot very much with colour in mind. But I quite like the way it all turned out. I’ve decided to publish the set on 500px. I’ve had an account there for a while, but so far I haven’t used it much. 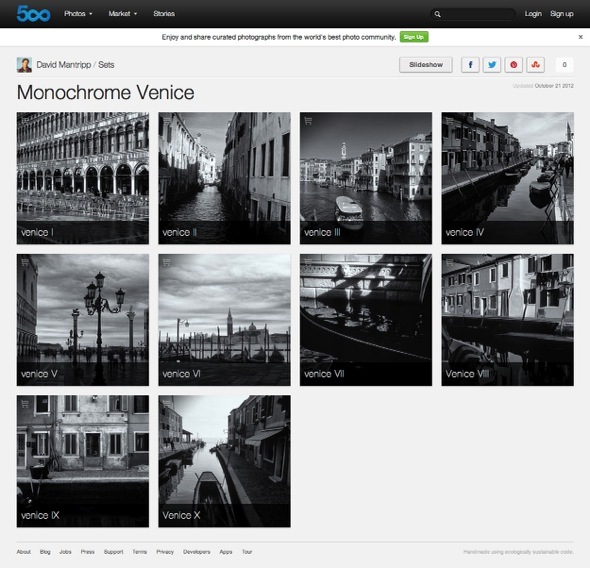 What I like about 500px over Flickr is that it lends itself more to publishing sets, or portfolios. Flickr of course allows you to create sets as well, but it really puts an emphasis on individual photos. I can’t say I’ve built up much of a following over the 5 years or so I’ve been on Flickr, so perhaps it’s worth trying another approach. Personally I feel my photos work better in portfolios - in fact I was nudged in this direction a while ago by a professional photographer friend - but photo sharing sites are pretty much all about the latest shot, followed 15 nanoseconds later by the next. Also somehow photos taken recently are granted more worth than ones taken several years, or more, ago. I don’t really know why that is. These photos are nearly 2 years old, but they wouldn’t look substantially different had I taken them yesterday. I’m not all that happy about 500px deciding that everybody’s photos should be represented by a square preview. That’s them imposing their aesthetic decision over mine. But I suppose everybody else does this too. Otherwise it’s certainly much cleaner and photo-centric than Flickr. Here’s one that didn’t make the cut. Possibly a little too clichéd. And there’s another one that didn’t make it to 500px, but ended up on Flickr instead. Well, I wouldn’t want them to feel left out.